Thinly sliced, diced or chopped vegetables like onion, carrots, celery, fresh fennel, zucchini, tomatoes, and chili peppers if you like a little heat. Coarsely chop the onion and garlic and mix with the sausage meat, adding some salt, pepper and fennel powder to the meat mixture. Fennel powder is widely available in Italy, and when I am in NY, I take fennel seeds and grind them up into powder. It’s a great flavoring for all sorts of roasted meats. Loosely pack the peppers with the sausage mixture and place in a roasting pan and roast for about 45 minutes. Timing will vary depending on how tightly you’ve packed the pepper and how big it is. If you are worried that the sausage may be underdone, use a probe thermometer inserted into the middle of the stuffed pepper to determine if it is properly cooked. About 15 minutes before the peppers are done, slice up every fresh vegetable that you have in the house, toss in a saucepan and with a little olive oil, salt and pepper, cook the vegetables. We like the heat so there were a few chilies added to the mixture. The smaller and finer the vegetables are cut, they more they will blend together and add an overall vegetal taste. If you want to taste the individual flavors of the vegetables, cut them into larger chunks. When they are all soft and mellty, add ¾ of a cup of water to the pan, let it come to the boil and then add the bulgur and cover the pan. The bulgur will be completely cooked in about 10 minutes. If it seems a little dry, add more water or a touch of olive oil. The water quantity is approximate here because bulgur comes in all different qualities, so read any info that may be printed on the label or box to give you a better idea of how much liquid to use. 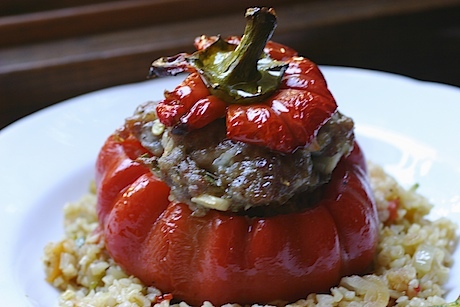 When the peppers are done, fill a bowl with the bulgur and vegetable mixture and place the sausage stuffed pepper on top. A nice crisp white wine like a Verdiccho or Tokai, and a piece of bread and you are all set. Enjoy. wow, this looks fun. Visually it’s so dramatic.The bulgur wheat is a great element to have here and I love what goes with it – the main thing being the fresh fennel. Taking notes as I still have sausage at home which I bought to do the other dish.